Most property owners take extra care to install excellent outdoor features on their property such as patios and decks. These installations add to the functionality and aesthetics of the space and offer the opportunity for the homeowners to use their yard more optimally. But these structures are generally exposed to the elements and don’t provide any protection from the sun or rain. This limits the extent to which they can be used during the daytime or when it's raining; this is where pergolas come to the rescue. We at Rou Pavers are one of the leading companies in the hardscaping space and have created a distinct niche for ourselves in the industry. 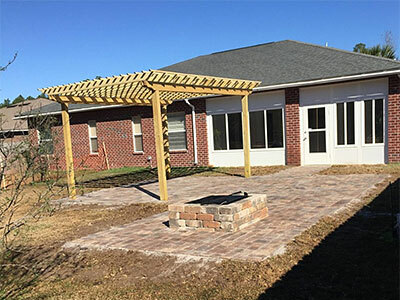 Our company has handled a significant number of pergola installation projects for clients in and around Pensacola, Golf Breeze, Pace, and Milton. We have designed and constructed impressive custom pergolas on properties in Navarre, Navarre Beach, as well as Pensacola Beach. Clients from across Fort Walton Beach, Baldwin County, and the surrounding areas trust only us for all their hardscaping requirements. We get a number of requests from our clients for patio pergola installations and provide excellent custom pergola design solutions at very cost-effective pricing. Most people like the idea of having open spaces on their property, but also feel the need for some shade structures. The ideal solution is to get a feature that offers the best of both worlds. A pergola provides a certain amount of shade without blocking out the sunlight completely. This elegant and simple structure can be installed in any area of your yard and we can design and construct one for your patio, deck or any other space in your garden. It can either be a standalone feature or attached to the exterior wall of your patio adjacent to your home. It is made of four posts that support a framework of battens at the desired height. You can grow creeper plants along this grid to provide some shade to the space below it. If you want additional protection from the elements, you can get a retractable shade or a shade sail installed along the grid. You can choose from timber pergolas or ones made of aluminum or vinyl etc. We make sure that the pergola we design for you complements the rest of the features in the landscaping in terms of its design, styling and the materials used. Only the best pergola installers will handle the job and this ensures the feature stays sturdy and durable. Our pergola designers work very closely with you to ensure you get the type of pergola that meets your requirements. If you are looking for pergola installation contractors that will cater to your specific needs and give form to your ideas, we are the company to come to. For any more information on our services and wooden pergola cost, feel free to contact Rou Pavers at 850-791-5641. You can send us your project details via this Contact Us form or request a free estimate and one of our experts will get in touch with you shortly.